Bead Up -- the journey of handmade jewelry: Giveaway! It seems like every time I have a jewelry party I totally crash afterwards. After 3 months of non-stop jewelry making, and weeks of building up for the party, a large sigh of relief often takes shape in not opening my craft room door for several days. Unfortunately, add to that starting a new job where I work 30-hour shifts weekly (hospital chaplain = love it, hate the hours) and suddenly making jewelry isn't so relieving anymore. So I inquire of you, friends: How do you balance your personal and your work life? How do you find energy when you come home from a draining day? As of late all I can do on the weekends is nap and maybe watch TV to decompress. Not fun! So, Bead Up buddies, my apologies for being so MIA lately. I have lots of new items to add to Etsy and custom pieces I have made here and there to share with you - which will happen - as soon as I can figure this balancing act out! Meanwhile, Bead Up is co-sponsoring a GIVEAWAY! 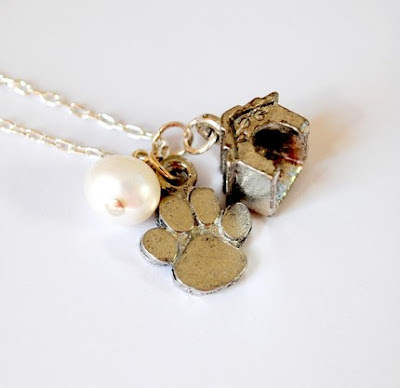 My sorority sister Kari of 2DogsAndABlog is giving away one of my dainty necklaces! Click here to enter -- but hurry! The giveaway ends on the 27th! Finding time is difficult- I have a 1hr commute each way to/from work. When I get home I don't really want to do much of anything. I try to set aside time on the weekend for crafting/baking, but even that is tough sometimes. Once you adjust to your new schedule I'm sure you will figure out a way to make time. Also, I'm off to enter the giveaway! I think it's fortutitous that it was posted on my birthday and is one of my new favorite pieces of yours.